This restaurant Pasta Recipe combines some great products, especially when sautéed in the fabulous garlic cream sauce recipe on the website. This recipe calls for scallops but you can use the recipe with almost any seafood. 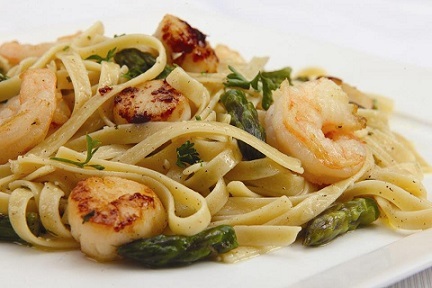 In fact, if you leave the scallops and asparagus out of this recipe, you’ve got a great Fettuccine Alfredo. Add shrimp for a delicious shrimp pasta. Use crab and you've got delicious pasta with crab. The garlic cream sauce is really delicious and serves as a “base” for many recipes. It is also a favorite restaurant recipe that helped build a successful restaurant for over 30 years. Discard the solids from the bottom of the pan. That's it. 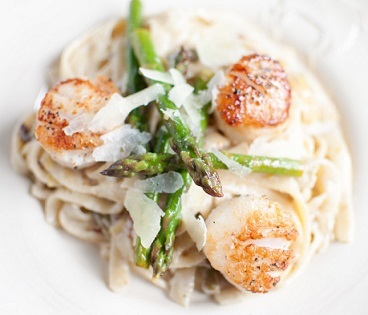 This restaurant pasta, scallop and asparagus recipe that will result in a meal you will be proud of! 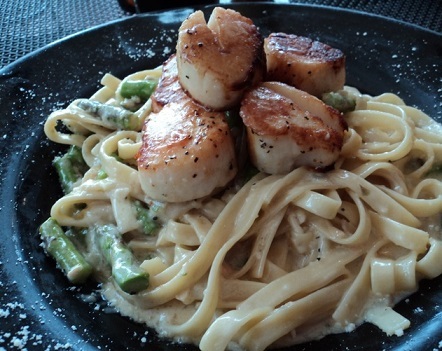 Enjoy your pasta with scallops and asparagus and the company of those you share it with! Did you know? In Alaska, there are three types of scallops. Bay scallops, which are a smaller variety. Rock scallops, which are commonly found attached to rocks, and Weathervane scallops which are sold as Jumbo scallops on the market.